Two 3.5” SATA hard disks bays, optionnal DOM or CF socket. 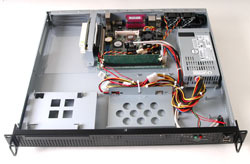 System board offer One PATA and 2 SATAII ports. two pins header for internal application. Two COM Serial RS232 including One Multi RS232/422/485..